A Special Sale on the anthologies – Overstocked! Clothes Lines $13.00 Women’s Spaces Women’s Places $13.00. Includes postage. Pay by check or with PayPal. 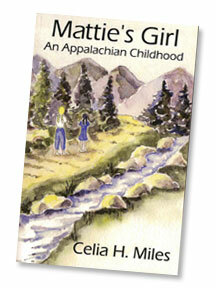 Celia Miles, a native of western North Carolina and retired community college instructor, edits and writes from Asheville. 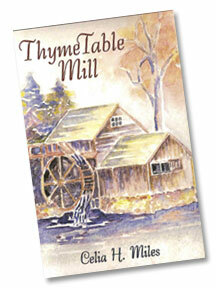 Old grist mills intrigue and enchant her—and get her heroine into difficulties and danger. When not traveling to find and photograph old mills and Neolithic sites, she’s reading about them and plotting the next novel. Having quit her marriage and teaching career, Marcy Dehanne, a newly established Mill Consultant, arrives at remote Wrapp’s Mill in western North Carolina. She expects to land her first employment: implementing the restoration of the small, deteriorating grist mill. 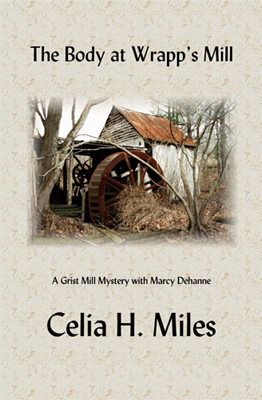 She finds, instead, a half-buried body behind the water wheel.The discovery of the corpse, unknown locally, complicates the possibility of restoring the mill, but with the help of a young female deputy—and a decided lack of enthusiasm from the sheriff’s office, the owner, and the handsome uncle of the deputy—Marcy forges ahead, risking her life to solve the murder and to restore the mill. Sarranda Boylett’s heart is mountain-bound–tied to her grandfather’s grist mill and her memory of one night of lavender-scented passion.In the early 1880s Sarranda, accompanied by Lila, a young Irish serving girl, returns to her beloved western North Carolina. With determination and hope as deep as Sarranda’s roots, the two meet challenges and obstacles in an isolated community changed by the Civil War losses and the influx of strangers. In a changing world where North and South may meet, even merge, without rancor and bitterness, their grit, grace, and humor allow for opportunity and love in unexpected places. Choosing independence over comfort, the present over the past, they forge new lives for themselves and provide hope and support to impoverished women and children in isolated Greene’s Valley. Recently widowed, Harriet Hendry takes her husband’s ashes to Orkney, but her unstated mission is to find out why the topic of his youth on the Scottish island was strictly off limits in their marriage. A good wife, mother, and helpmate in a business she never imagined running, now on this green and serene Scottish island that she deems “magic,” she begins to shed her “buttoned up” self. With the assistance of a teenage driver, she explores Orkney’s layed landscape and history and meets its people. Shards of memory intermingled with inexplicable experiences among Orkney’s monuments free her to face her life’s failure and choices. 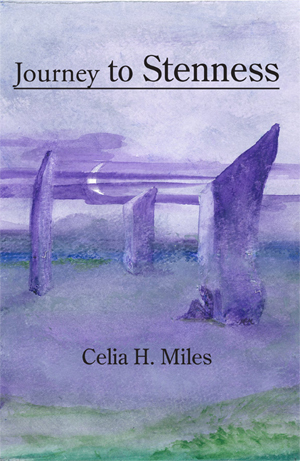 Whether investigating the background of a reticent husband or Neolithic villages, stone circles, and chambered tombs, whether seeking cultural or personal facts–she realizes that the past is interpretation through the eyes of the present and the individual. She cannot change her husband’s past, but she can journey beyond it. 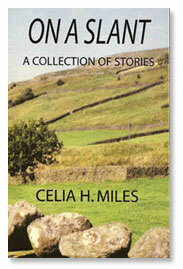 We all love a mystery and Celia Miles gives us an intriguing one in this tale of self-discovery. Harriet Hendry is a recent widow, still in shock over her husband’s untimely accidental death. Or was it an accident? She decides to take his ashes to the West Mainland of the wet and wind-blown Orkney Islands, off the coast of Scotland. Though he never expressed a wish to return to the land of his birth, Harriet feels guilt and shame that she didn’t know her husband and his roots at all. Why did he never speak of his childhood, his parents or where exactly he was born? Enduring much family and social criticism for her decision to leave a comfortable life to make this quest, Harriet explores this beautiful land of dramatic seascapes trying to piece together his early life. She finds the locals are reticent with information. Why? Did her husband live here at all? Then an encounter at the ancient Stones of Stenness provides a clue. Or did she dream this? Celia Miles leads the reader through mysteries within other mysteries as Harriet discovers facets of herself and gains the strength of her own convictions. The reader will recognize similar emotional experiences in Harriet’s frustrations, self-explorations and moments of truth. And what of her husband’s truth? Warning: This book contains strong and delightfully eccentric characters, well-drawn by a master story-teller. 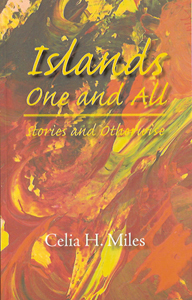 I felt that Celia Miles must love these islands for they are so lyrically painted and hold such a fascinating history from Neolithic villages to war-time occupations. This lovely read takes its place on my shelf of favorites, along with Mattie’s Girl and On a Slant, two Miles’ books that I re-read with joy and give as gifts. Left with Aunt Mattie and Uncle Cade (the sheriff) in the North Carolina Mountains, nine-year old June becomes “Mattie’s Girl” when Cade is killed at the home of her best friend PeeDee. In stories deeply rooted in the late 1940s Appalachia, June chronicles the years between meeting the irrepressible PeeDee and losing her. She struggles to understand her mother’s indifference, her father’s divided love, her grandmother’s sudden death, her grandfather’s being institutionalized. Three years later, PeeDee, riding the rails west, brings a final gift and the truth about Cade’s murder. In this world forever gone, June survives and triumphs through the grace of family and friendship. The book is astonishing. Simply astonishing. I’m a slow reader and am savoring it, but I did want to tell you that I am amazed at the elegance of it and my attraction to the characters who are perfectly–perfectly drawn! Cary Randall hopes to escape physically and recover emotionally from an unhappy relationship by finding serenity at ThymeTable Farm in the Blue Ridge Mountains near Asheville, North Carolina. What she doesn’t need is a handsome herb farmer with troubles of his own or a young doctor in search of a wife. Spence isn’t looking for a poetry-quoting tenant as he struggles to keep his farm and his neighbors’ property intact and his heart secure. Attracted to her landlord, Cary immerses herself in photography and herbal lore while Spence resists risking his heart and wonders about Cary’s involvement in her brother’s land development scheme. Both wonder if this is A Thyme for Love. Along the way, Cary gleans a collection of recipes–from cucumber soup to eggplant casserole–sure to please anyone who visits Rosemary Cottage, ThymeTable Farm. Happily married to her herb farmer Spence and engrossed in her photography, Cary Bradford longs for two “heart’s desires” to make her life complete—a child and a water-powered gristmill for ThymeTable Farm in western North Carolina. With enthusiasm, naivete, and determination, she sets out to achieve her goals, learning about mills and patience along the way. The Cove community, with their farm at its center, deals with loss, changes in relationships, and a mysterious newcomer to their midst, and together they work for Cary’s dream–a mill for ThymeTable Farm. In locales as varied as hometown back yards and mall, the canals of Venice, stone circles in the British Isles, abandoned tomato fields in north Georgia, the Greek islands, and Portugal, these stories feature women: women at their breaking point, turning point, mending point, women from age six to sixty-six engaged in searching, suffering, surviving, and coming to terms with their situations, each unique, yet universal. Memory and reality; fiction and reflection; journeys to faraway islands, journeys home…these stories and memoir-like pieces deal with contemporary issues but don’t come up with solutions; they delve into the recent and remote past, into the function of memory and the nature of reality. From the Greek island of Patmos to southern small town Blaylock, from the Scottish peat bogs to funereal memory revived on Hard Hill Holler, whether reflecting on food, family, or fate, they embrace the idea that we are ultimately connected to the past and to each other but that ultimately we are islands one and all. 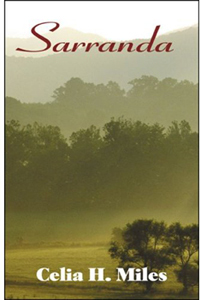 With unflinching honesty and a survivor’s grace and humor, Sarranda chronicles her life during the pre-and post-Civil War years in isolated western North Carolina’s Greene Valley. From childhood when her father leaves for the California gold fields through a youthful marriage and the turbulent losses the war brings, she finds solace in her grandfather’s love and at his grist mill and an unexpected awakening in the arms of an unnamed stranger. In a time disrupted, a family fragmented, and a land almost destroyed, Sarranda reveals the strength, endurance, and spirit of the mountain woman. “I purchased a copy of Sarranda during a signing Celia was giving outside Mountain Made in the Grove Arcade in Asheville. The story is sweet, sad, funny, and human. It’s been a long time since a book brought tears to my eyes, but sections of Sarranda’s story caused me to weep in familiar sentiment. Celia tells the story from her heart. I would love to see Sarranda’s story continue. BUY THE BOOK In her 1929 lectures, Virginia Woolf, hoping to leave her audience with “a nugget of pure truth,” exhorts give a woman a room of her own and let her speak her mind. Almost seventy years later the Dixie Chicks proclaim in their mega-hit “Wide Open Spaces”: She needs wide open spaces/Room to make her big mistakes/She needs new faces/She knows the high stakes. And a word about the editors:Celia and Nancy were on the board and editors of A-B Tech’s literary magazine, Victoria Press, for more than ten years, from its inception. They knew they worked well together, could stick to deadlines and could compromise when they didn’t agree on commas or grammar. Between them, they have sixteen books in addition to the three anthologies (2008, 2009, and 2011) of work by regional women writers. Taking classes, going to book fairs, meeting and reading the work of their colleagues, they “solicited work” for the first anthology with its Christmas theme and never doubted they would have a book worthy of publication. “Collaborating has been fun,” Nancy notes. “Our ‘office’ is McDonald’s, where we rehash our individual editing and conclusions. It’s satisfying to see the collection come together.” They agree they’re especially happy with Women’s Spaces Women’s Places. 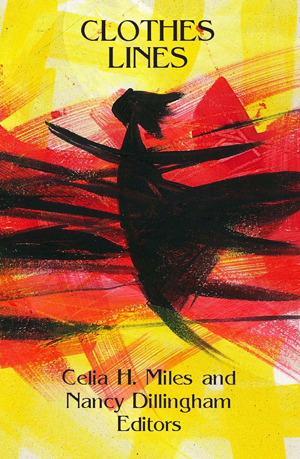 Celia H. Miles and Nancy Dillingham, co-editors and contributors, have just released a 241-page anthology entitled CLOTHES LINES from 75 western North Carolina women. From Birkenstock to bras, red shoes to polyester pink pants suits, prom dresses to funeral gowns, women as different as their garments reflect on their fascination with and feeling for the clothes they wear, remember, resist, and revere (or not). 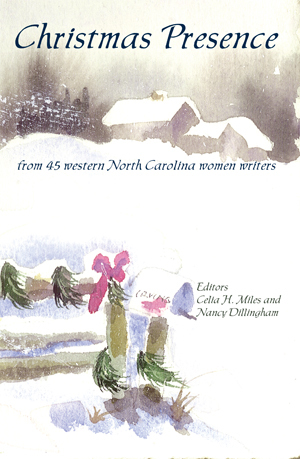 Christmas Presence is written in the unique voices of women writers who have roots in and connections to Western North Carolina. These Christmas stories, essays, poems, and memoirs, many set in the 20s, 30s, 40s, and before, add seasoning to the cultural landscape of a region already rich in custom and lore. “Christmas is a special time, an intense season when emotions are heightened, memories are made, hearts are warmed or broken, illusions blanketed or shattered. Relationships reveal their soft and sharp edges; joys are magnified and so are losses. Joan Medlicott, author of the Ladies of Covington Series. If you have ever wondered what kind of people produced those Shaker chairs, oval boxes, herbal teas, and songs like “‘Tis the Gift to be Simple,” you will want to read The Gift To Be Free by Louis Miles. In this invented memoir, Sister Hattie Ingraham, the fictional narrator, describes her nearly eighty years in Shakerism. She has watched the inexorable decline of Shakerism and grieved its losses. Finally she and her Shaker sisters face the most difficult decision of their lives – to obey the order from the Parent Ministry to close their membership and allow their church to perish or to welcome all those who seek to live the Shaker testimony. 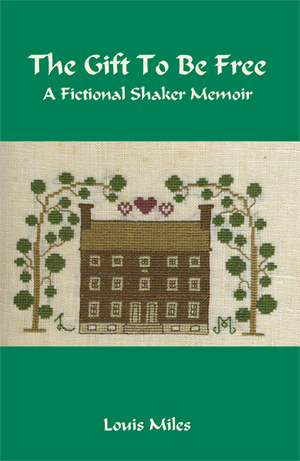 The Gift To Be Free: A Fictional Shaker Memoir by Louis Miles.